The podcast for May 1915 features the second part of our interview Heather Montgomery from the School of Geography, Archaeology and Palaeoecology, Queen’s University Belfast. Heather is researching the practice trench systems that were built all across Ireland as the three Irish divisions (10th, 16th, 36th) trained for trench warfare. Heather mentioned the Defence Heritage Project that she is involved in. They are looking for the public to contribute information and knowledge about WW1 structures in their area, so please have a look. A big thanks to Heather for contributing to our understanding of our family history. 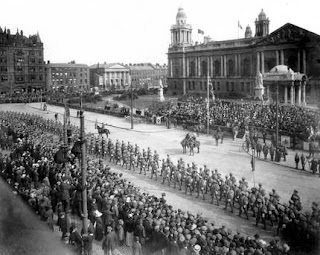 We also hear the letters of John Adams while he readies for the 36th (Ulster) Division parade in Belfast, 100 years ago, and a letter home from his sister Jeanne.